I think it is safe to say that all practice oriented programs use simulation in some form or other to help students experience work or client/patient situations in a controlled setting. In considering this, it occurs to me that we could all be learning from what each other is doing. I thought we could use this space to talk about the simulations we are using and help each other with suggestions and ideas. In the Nursing (Register Nurse (RN) and Licensed Practical Nurse (LPN)) and Health Care Aide (HCA) programs, we have always had simulation labs where students learn the psychomotor skills of their chosen profession (such as catheters, injections, and intravenous therapy) but this year marked an exciting new chapter in simulation for our programs. The control/debrief room for the high fidelity simulator (seen through the window on the left). Across the hall is the door to one of the medium fidelity simulator rooms. In the fall of 2013, Health and Human Services unveiled three state-of-the art simulation suites. These rooms are meant to simulate as closely as possible the experience of working in an acute care (read hospital) facility. 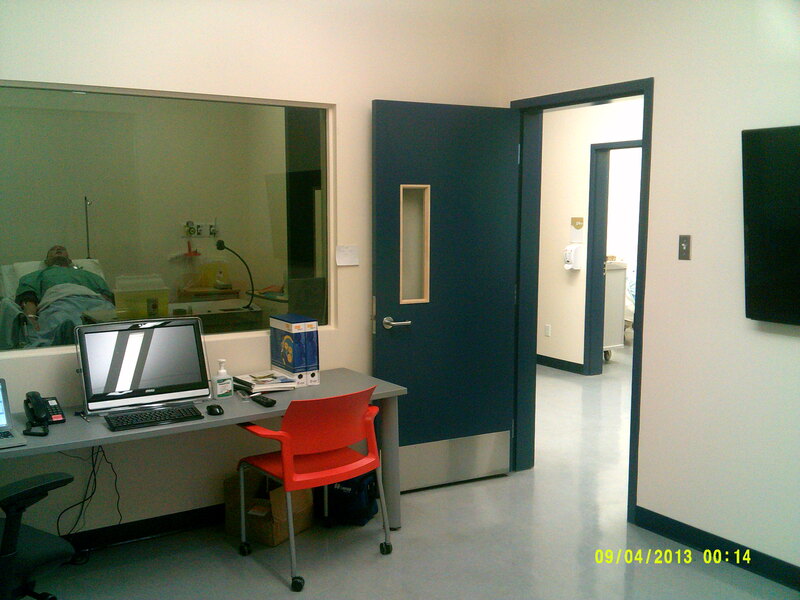 All three rooms are set up with a Human Patient Simulator (HPS) in one room, separated by a one-way mirror from the control and debrief room. The foot of the HPSs bed is facing the control room so the observer(s) can see everything that goes on in the room. There are microphones and three cameras mounted on the ceiling of the HPS room so that all the action can be captured and played at a later time for either one-on-one or group debriefing. In the control room, there is a computer that is used to control the taping and cameras and a second computer or tablet that controls the HPS. The HPSs are wonders. We have two medium fidelity and one high fidelity simulator. They look like mannequins and have routers associated with them that connect the computers in the debriefing rooms with the HPSs and the monitors in the HPS rooms. The term ‘fidelity’ is related to how closely to humans the simulators can respond when something is done to them. With low fidelity HPSs, we can do things to them, but they do not respond at all. 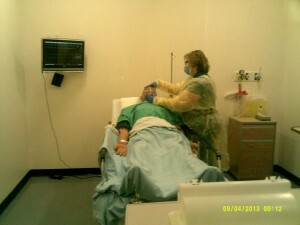 For example, we can insert a catheter or do a dressing change to them, but they cannot speak or contain bodily fluids. Medium fidelity means that they have vital signs, which means that we can do a blood pressure (usually on one arm) or listen to respirations. On these HPSs, we can also do things like start an IV and get blood back and we have a microphone so that we can speak for them. We can change the vital signs to mimic different states like bradycardia (slow pulse) or tachypnea (fast breathing). The monitors show the vital signs that occur throughout the simulation. Here oxygen is applied to the simulator. Finally, the jewel in our crown is the high-fidelity simulator. It does everything the medium-fidelity stimulator does and then some. If we catheterize it, we can make urine come out; we can make it have a post-operative bleed, or have a cardiac arrest and then shock it just like they do on TV. It has some pre-programmed things that it says or we can speak for it through a microphone. If we give it some medication, the computer will make the vital signs on the monitor react as they would if we had given the medication to a real human. At that point, the computer starts calculating how long it would take the medication to clear the body and would make the vital signs react accordingly. Impressive indeed. We are very excited about the potential for these new additions to our program. My job as the Simulation Coordinator is to integrate the use of these new suites and simulators into the RN, LPN and HCA curricula, and I will keep you posted in the coming weeks as to how this is evolving.